Can it be more Southern than pickled peaches. Pickled Pink doesn't think so. 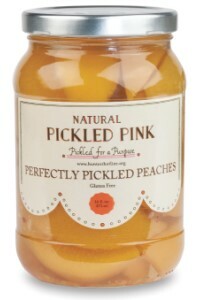 They pickled their all natural Perfectly Pickled Peaches with a hint of cinnamon, clove and with a touch of red pepper to add some zip. Ingredients:peaches, vinegar, sugar, salt, spices.